A super massive black hole is million to billion times more massive than our sun. These monsters hold an entire galaxy around it with its super powerful gravitational attraction and our galaxy is not an exception. A black hole is one of the most mysterious and potentially dangerous objects in our universe having a never ending huge appetite for anything in its premises. Maximum black holes are “Stellar black holes” that are 5 to 30 times more massive than our sun; but, they have cousins who are as dangerous as them and even million to billion times bigger. How a Super massive Black hole is created? 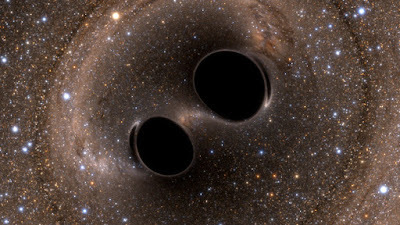 Scientists believe that the super massive black holes are created after the big bang event, when our universe was a new one. They are formed when stellar black holes grew up by feeding gas & dust around them and merging with one another due to events like “Galactic collision”. 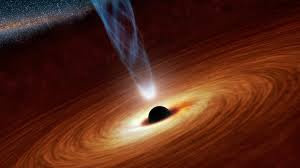 A super massive black hole are indeed the most massive object in the galaxy and hence goes into the centre of galaxy and thereby holds the entire galaxy with its immense gravitational force. The mass of a super massive black hole at the centre of our Milky way galaxy is 4 million times more than our Sun. Death by a super massive black hole is much more different than that of by a stellar black hole. Unlike the stellar black hole which will reap you in shreds before entering into its deadly vortex; a person will actually experience free falling inside a super massive black hole. This is because of the fact that; the black hole is not only more massive but also, very large in size. Hence, the tidal forces are weak enough to torn apart a person before the entrance into the “Event horizon”. However, deep down inside a black hole, the centrifugal force due to the rotation of the black hole provides effective repulsion to any mass coming inside. Therefore, the objects falling in will collide with the matter trying to come out & the result of such energetic collision is an unimaginably chaotic maelstrom of super hot & dense plasma. So, the person will be ultimately roasted inside. To be on the safe zone, a person needs to keep a distance of about million to billion miles from such monsters. The super massive black hole in the centre of our galaxy became dormant and not eating the matters around it much. 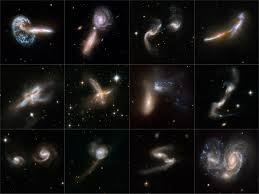 This is partly due to the fact that, as a galaxy ages; less and less matter is present for it to gorge on, but, in future it may become active if it gets some fresh supply of gas & dust. One way to rejuvenate the appetite of our black hole is to collide our galaxy with some other galaxy. This may sound impossible, but, our Milky Way galaxy is going to have a collision course with our closest neighbor galaxy “Andromeda” present 2 million light years away from us & marching towards our galaxy with a speed of about 75 miles per second. But, we shouldn’t afraid because this collision will not happen within the next 2 billion years. Though galactic collision is not a danger for us in this time being but, there may be some more immediate dangers on the space. In our cosmic neighborhood, millions of light years away; there are hyper active galaxies which have “Quasars” at their centre. In our next and last part of this series, we will discuss about the most dangerous place and the true hell of our universe named “Quasars”.